The only thing more sizzling than the soaring temps, is our pick of this weekend’s hottest things to do in Sydney. 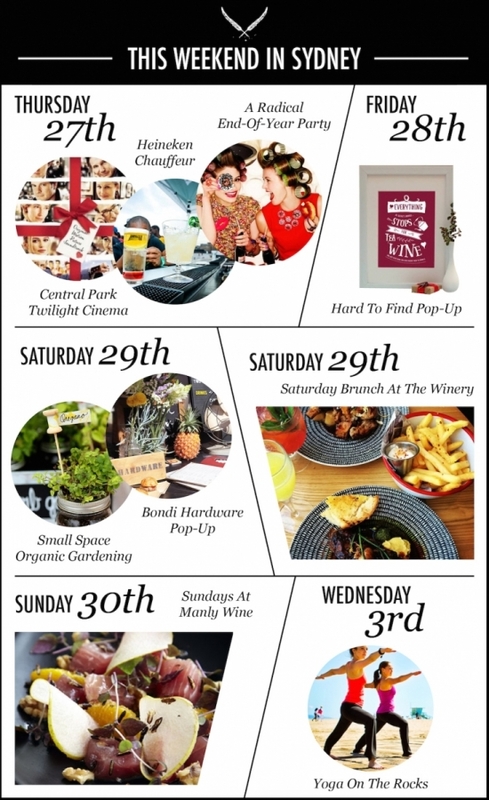 From twilight cinemas to cute Christmas shopping ideas, learning experiences to yoga on the rocks, this weekend has it all. And the unofficial award for “pretty much the best location to watch your cult Christmas Classics” goes to Central Park Sydney. Showing at this year’s Twilight Cinemas (adjacent to Chippendale Green) are Elf on November 26th, and Love Actually the following night. What you might miss in overpriced choc tops, you can make up with a $10 voucher to spend at the nearby Central Kitchen. We’re definitely not down with combining drinks and driving, but this situation’s a little different… The aim of the promotion offered by Heineken and Uber is to encourage Aussies to explore their own backyard. The catch? You don’t get to choose the destination so you better be the up-for-surprises type. Here’s how it works – You call a chauffeur (no credit card details are exchanged), and if your booking is one of the lucky ones, you and up to three amigos will be taken to a mystery destination, courtesy of the uber-cool app and our favourite Dutch brew house. That would have to be the best designated drive we’ve had in a long time! Check out the website for the details. We called it first – healthy is the new hangover this holiday season. Don’t believe us? Check out Earth Events’ end-of-year celebration; designed to bring out the happy hippie in anyone. The Darling Harbour happening - which features an interactive panel of lovely level-headed ladies (think NYC’s Gala Darling, Julie Parker, Melissa Ambrosini and Rachel MacDonald) answering your Q&As will also offer musical performances and great-for-you bites to get you thinking about all the big-deal events of the year that passed. And if you pay attention, you’ll be filling your notebook with bullet points on how you can make 2015 even better! Don’t let the name throw you off. “Hard to find” refers to the unique collection of gift ideas, and NOT the location of this online-store-come-temporary-showroom running at the actually rather-central site of The Rocks this weekend. In fact, with an amazing selection of fashion, accessories and home wares, edited by founders Eri Stewart and Trudi Jenkins, it is ironically “easy to find” the perfect pressie for all your peeps here, just in time for Christmas! If your fingers feel more comfortable around a green smoothie as opposed to being a green-thumb, then this hands-on gardening work shop could be worth tending to. Led by urban farmer, Adrian Baiada (as part of Egg Of The Universe’s Urban Garden Project) you’ll be growing your very own organic, nutrient dense food regardless of experience or the concrete jungle you currently call home. Let’s not beat around the bush – it’s unlikely you’ll walk away winning any agriculture awards, but you will learn the skills to design, establish and maintain an edible garden with a nature-based approach. And frankly, we kinda dig that. The newly opened Champagne Room upstairs at The Winery has just begun holding champagne lunches on weekends. If your girlfriends are planning a long overdue catch up, this champagne lunch is a way to do it in style. You and the girls will be spoilt with a flute of Perrier-Jouët, a lavish menu that involves lots of fancy cheeses and city views from the location’s upper floor. Apparently unsatisfied with its status of “world’s best bazaar by the beach”, Bondi Markets has improved it offerings by inviting Bondi Hardware to set up stall. Every fortnight from this Sunday, you’ll be able to accompany your Bondi visit with a side of sliders. The BH popup bar will be serving a choice of three mouth-watering mini-burgers, including smashed egg, aioli and brekkie relish, prawn, avocado and chipotle remoulade and beef, cheese, pickles and tomato jam as well as seasonal fresh fruit punch. Enjoy a variety of fresh crabs coupled with pitchers for $20 from Manly Wine’s crab shack every Sunday. Throw in Pinnacle Sound System (Sydney’s finest DJs and vocalists working together to give live “mash-ups” of classic songs), and you’ve got yourself a pretty swell way to end your weekend. For things to do in Sydney this weekend that involve a little bit of learning, Two Up might be just the thing for you. Two Us is a series of back-to-back lectures from experts in completely different fields. On Sunday night Miles Merrill will be talking about spoken word poetry while Zevic Mishor will be discussing psychedelic support. Pair these lively discussions with wines from Cake Wines and a little bit of cheese and this will be one evening not to be missed! Do not be mistaken. The good gang at The Glenmore Hotel have not confused their sun salutations with scotch. Instead they’re offering you an on-the-house (rooftop, actually) opportunity to start your day with a vinyasa flow session as part of Lululemon Athletica’s #givepresence series. The one hour class is suitable for all levels of flex, and even those not down with downward dogs will appreciate the complimentary breakfast, tea and fresh juice provided post-session. Registration details can be found here. Ommmm.